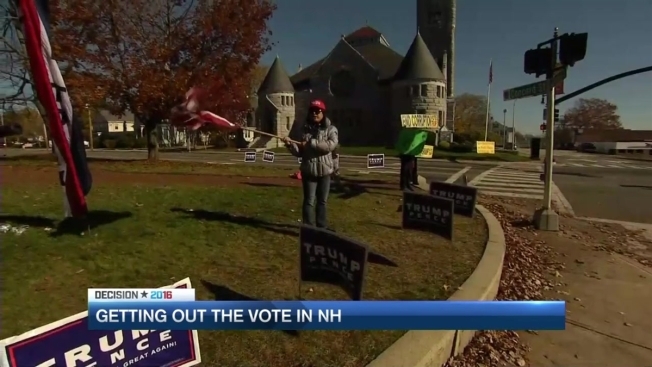 Massachusetts residents are driving to New Hampshire to help out last minute voters. Jessica Kim pulled her kids out of school to canvas on behalf of Hillary Clinton. Jenny Cheung was in Nashua showing her support for Donald Trump. Mike Rowan even rented a minivan and offered rides to anyone who needed to get to the polls. All three agree that Clinton is likely to win in Massachusetts, but the four electoral votes in the battleground state of New Hampshire are still up in the air. And with a close senate race between incumbent Kelly Ayotte and Governor Maggie Hassan that could decide who controls congress, these volunteers believe every vote counts. Kim says her job isn’t to persuade anyone towards one candidate or another, she just wants people to get out and vote.